By Jaime Novoa , May 3rd, 2016. 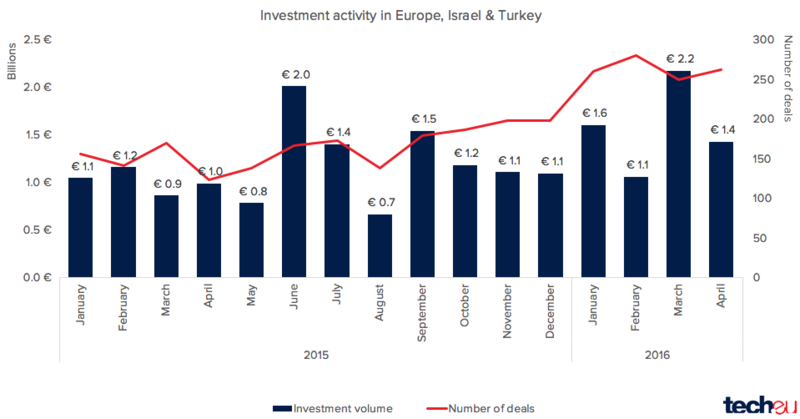 2016 continues to be a record-breaking year for the European, Israeli and Turkish startup ecosystems when it comes to fundraising, as more than 1,000 tech startups have secured capital in the first four months of the year. The 1,053 investments closed from January to April combined for €6.2 billion, almost half of all capital raised in 2015 (in 1,500 deals) across the region - notably including Spotify's $1 billion debt round. Last year, the 1,000 deal figure was not surpassed until July, which points to the fact that the European tech ecosystem is de facto accelerating, at least in terms of funding deals. The majority of these deals took place at the early stage, with one third of all rounds being smaller than €1 million and 63% smaller than €5 million. This, as we have previously commented, means a slightly lower average size of investments, and implies that any possible sign of a market cool-off is currently being offset by a significant surge in the number of total deals. The €6.2 billion raised in the first four months of 2016 represent a +54% year-on-year uplift, whilst the number of deals have increased by 78% compared to the same period a year ago. For more information, please read our in-depth report on the European Tech Funding markets in Q1 2016 - which you can buy here for £99.